NOTE: As of 2013, this dry food list is not updated (except EVO was recently removed due to several recalls). The wet food list is updated more often. ALSO: Please avoid feeding the high-protein DRY foods listed on this page to cats with kidney trouble or elder cats who are vulnerable to kidney trouble. I like people who want to find the best food for their cat, because I have come to believe that cat food choice alone can actually prevent diseases and extend a cat’s life. I provide this list because I know most people (and mainstream vets) choose dry cat food at least some of the time and I want to make sure that these people can at least help their cat avoid diabetes and digestive diseases (possibly even intestinal lymphoma) by making better dry food choices. To find out more, see the post on how I selected these foods. 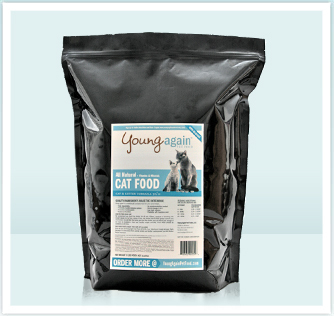 A good alternative to these dry foods is the raw dry cat food ZiwiPeak, listed in Best canned and raw cat foods. If your cat has special health needs, please be sure to consult with a good vet about their food. To assure you these food reviews are unbiased, I never use an affiliate (referral) link for a cat food. artificial hormones; sustainably farmed. Fish are wild-caught. For kidney and urinary health, use dry food only occasionally or in rotation with wet food. preserve health qualities, it’s added after cooking. 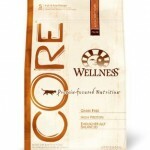 preventing feline diabetes and more through low-carb, grain free food. occasionally or in rotation with wet food. Tip: I can only find it online, directly from the Young Again site. Avoid the Rabbit formula, as the rabbit is processed in China. say dry foods are too dehydrating for cats with kidney problems. tested for heavy metals. No by-products. Introduce slowly and gradually. Minimal-starch cooked food can require time for system to adjust to. Very high cost compared to others on list, but similar in cost to good canned foods! 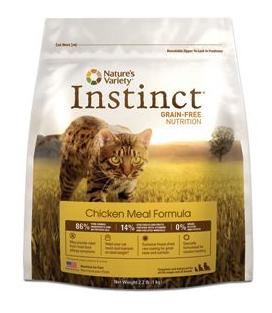 Includes ground bones, which some cats have trouble digesting. Ground bones may also not be ideal for cats with kidney disease (check with your vet). See These natural cat foods didn’t make the “best” list: here’s why. Many cat foods almost made this list. There were so many foods, I had to be brutal in selecting. Maybe I missed a food. Let me know if you have questions. 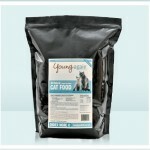 Looking for the Best canned and raw cat foods? How to get your cat to eat new foods? None of these foods are perfect, but they met the “best of” criteria for dry cat food. However, every cat has different needs, just like you and I do. What about Healthy Extension dry good? This is what my vet recommended. So I see blue buffalo grain free or Precise grain free didn’t make your list. I’ve got 11 cats that are all spade and nuetered and I pray no more get dumped off. As you can imagine it’s quite costly to feed , flea&tick, wormer, ear mite etc. Though I’ve gone to de for the latter, there’s no way I can afford the brands you chose. Maybe they wouldn’t consume as much if the food they were eating met their nutritional​ needs. Any thoughts? UTI and stones with Minnie, my female 7 yr. old cat. The vet put her on Hill’s CD prescription,(wet and dry) much to my negative thoughts on that crap food. I have all cats(3) on it and and within a week, all are now sick from the food, haven’t pooped in almost 2 days and also puking. My UTI cat is even worse that she was 2 weeks ago, plus she’s on several different drugs. Terrible food with corn and wheat in it. My cats have been on a grain free diet of dry and wet for a long time. DO NOT put your cats on any prescription cat food period! It’s scam of over priced, terrible ingredients. After $500 in vet bills in 2 weeks, Minnie is not better and now I have 2 other sick cats. My male cat has early stages of Renal. He has been on Standard Process Feline Renal Support(excellent product, all natural) for 6 months and has done wonderful. It even cut back his consumption of excessive water drinking and urinating. Now he is very sick from changing to Hill’s! Beware cat owners. Both cats are going to the vet today. Also taking back all the crap Hill’s CD wet and dry. Going back to grain free. I have 6 cats, 2 older ones will absolutely not touch wet food. I saw your comment about not feeding older cats the high protein dry foods on the list. Any suggestions for older kitties. Also, what is a good hairball remedy or maybe food that can help with hairballs? I’ve been feeding my cats Orijen dry food, and Life’s Abundance soft food. I really like the ingredients in Life’s Abundance soft food compared to every other brand I’ve looked up. Although, LA does have some ingredients in their dry food that I don’t think are safe. I was reading with Orijen that the sea food content is too high and may cause issues in the long run, is this true? I’m surprised that Eagle cat food is not mentioned here. Reviews say that breeders, dog sleighers, people with sick pets, all got the best reviews. Anyone try this brand? I am taking mine off Royal Canin, Vet’s recommend but it seems they get paid to carry that brand. I am trying Eagle all my cats ate it first try, so we will see if reviews I read are true. I feed kibble and wet food. I put water in their wet food. I use Weruva brand which is expensive but think one of the best canned foods. I also feed natural balance canned pate. my cats of course are picky. I am no longer going to feed fancy feast. My cats are all healthy except one boy he had two trips to the vet for constipation so I am changing kibble to EAGLE and being more selective with canned food to be mainly Weruva and Natural balance. I also tried 4 star beef Fromm kibble which they all ate first try. Most foods they will not eat, as I have tried almost every kind of cat food that is expensive on the market ie.,Vet and Pet store brands. I would like to try the absolute best and safest raw food. I tried raw before and no one would eat it. I am interested in this raw egg shell? 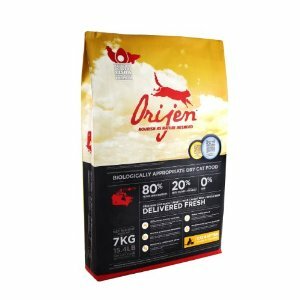 I fed mine Orijen(Expensive in my area) and they liked it, but they adore Wellness Core Grain-Free, I’m glad to hear about its low ph I know that its good to feed cats all/some wet food, but the only kind that one cat will eat(the other turns up his nose at it!) is Fancy Feast. So…do I supplement with fancy feast or what? I’ve tried all of the high quality canned food and neither one will touch it. Here’s the thing: If there is a way for me to choose something more affordable, I would really like to. I have no problem with paying a more for quality and high standards, but if I can still find something good that is cheaper, I’m going to do it. 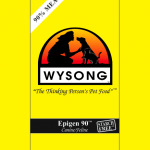 Recently our local chain of grocery stores launched a natural dog and cat food line. It’s called Wegmans Nature. I can’t find the cat food labels online yet, so I can’t share a link with the ingredients, but I think they might be pretty good. But I am not sure. There is carrageenan as the 3rd to last ingredient in the wet food. They dry food looks good to me. But again, I really need someone who is more well-versed in this to help me out. I wish there was a way for me to upload a picture of the ingredients list without typing all the ingredients…. Is there anyone else who lives in the Wegmans region and wants to look at the labels and let me know what they think?? Jody, have not research this for cats at all, but have you thought of giving him a little coconut oil for his hairballs. All three of our cats started doing really well when we added small amounts, say half teaspoon a day. Theironically fur improved and our overweight cat lost weight. Even our kibble girl would eat it. It’s something you might want to research and try. I would love to put my tabby on raw or canned, but he would prefer to starve to death than eat wet food. So many people don’t understand that not all cats are crazy about canned food, so I am grateful for this list! He thinks all kibble is the greatest thing ever so no problems there. I put him on YA about 4 months ago. He trimmed up, which is great, and is healthy as ever. However, he seems to be increasingly plagued by hairballs. This coincided with me putting him on house arrest, so it’s possible he’s missing something he was getting outside. Enzymes? But if he goes outside then he pukes up grass all over the house, and practices catch (outside) and release (inside). Choose your battles? But I wondered if I should supplement with YA digestive support, or something along those lines. Any recommendations on hairball remedies? It is shedding season. Perhaps it will resolve itself in time. I strongly agree with you, Dry Cat Food are subjected to high temperature during production thereby damaging it’s nutrients, I don’t use it and will never recommend it to anybody. When my 13 year old male was diagnosed with diabetes I gave YA zero carb a try but the high protein wreaked havoc with one of his kidneys and he lost weight (which he did not need to do). So, back to wet food along with grazing on low carb/lower protein dry as I continue working with his vet. Luckily he’s willing to work with us. I feed my Siamese kitten (although too quickly nearing 1yo) almost entirely wet food, and only putting out dry on days where I’m running late to work, or won’t be home to open another can for him. My question is about Nature’s Variety Instinct dry. I found it on amazon, but I also found the same food with “Raw Boost”. What are your thoughts on how the raw boost version compares to the one in you put in your list? I’m not sure what to do. I’ve been feeding my 3 boys Fancy Feast twice a day and leaving Nulo dry food out all day. Twice a day I only give them one maybe two cans split between them, because of their eating habits. My 13 year old is very fussy and will like something one day, but not the next, then eat it again the following week. One of the twins will eat very little of the wet food, always leaving some for the two alpha males, but grazes on the dry food all day. The other twin will eat just about anything, but he gobbles everything and throws it up 5 minutes later, so I have to separate him from the other two. And their tastes are all different. One doesn’t like chicken or turkey, one doesn’t like salmon, beef is a hit or miss with them, and I can never know what the 13 year old will want for that meal (fussy). I’ve recently switched to Nulo wet food and after trying all their flavors they liked the Duck and Tuna. So I bought two cases, they loved the it for about 2 weeks, but now they just nibbled at it. Reading this blog, I need to switch again because of the tuna causing cancer. My 13 year old has end stage renal failure and hyperthyroidism. He only weighs 7 lbs now; he lost 4. The vet gave me meds for his thyroid and heart. The heading of this blog said not to give DRY high-protein food to cats with kidney problems. For as long as I can remember he has always vomited 1 or 2 times a week, not food, but some hair in a lot of stomach fluid. There has never been any correlation between what he’s eating and his vomiting as far as I can tell. I want to get him on more wet food because he needs the liquid. Here’s my question. What do I feed these guys? I’d give them different foods according to their tastes, but they can’t eat a whole can and they all refuse to eat any leftovers from the fridge. I tried warming it to room temperature but they won’t eat it. So it gets expensive to throw out what they don’t eat. 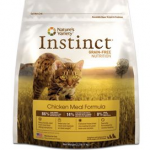 One of the best dry foods on the market now is Instinct Ultimate Protein (No Animal Meal0. So my kitten has been on several types of food since we got him from his foster mom Labor day weekend. He was such a tiny kitten for 10 weeks (wasn’t nursed for too long). She was feeding him Friskies which I knew was a low quality food. I didn’t have time (since it was a quick decision) to go shopping for kitten supplies, my fiance went. He never grew up with or raised a kitten before, so picked up Blue Buffalo thinking that it was the best. I did my research the day after we brought home Peaches and I discovered so many health problems reading reviews from owners who feed their pets BB. The next take I returned the BB and switched him to Nature’s Variety Instinct chicken kibble. He grew so fast, and he’s a really strong muscular cat with a trim waist. He has lots of energy and his poops have gotten so much cleaner since the switch in foods. His coat is soft, smooth and shiny, his eyes are clear and no allergies. He’s intelligent, learns fast and is a friendly cat. He’s almost done with the 12 LB bag of chicken kibble and now will be starting the duck and turkey kibble. In edition to the kibble we also got the duck and turkey cans so he can fill out a little more. I’d have to say I’m a NV fan for life! Is there an updated list for 2015? Any thoughts on Blue Wilderness? My cats love it, but I’m skeptical – I tried slowly switching to Orijen, but they wouldn’t touch it so I gave up and stuck with what they love. For those concerned about UT issues in their cats, please google D-Mannos for cats. One of my boys had severe problems, but since adding D-Mannos to their diets along with their wet food, none of them have had any problems. do the research and see what you think. I switched to Wellness and my cat got a UTI, first and only one she’s ever had. Looking online I am not the only one who has had this issue. My cat got a uti after 3 weeks on wellness turkey (green can). He never had a uti before. He had to eat purina ur for 6 months dry and wet. I feed him Orijen dry now but mostly wet natural balnce, aheba and fancy feast and he has been fine for 2 years. When I feed dry food, I add water to help with hydration. I’m surprised this isn’t a more common practice: is there something I’m missing? I’m not concerned about freshness, since the cats finish their food within minutes of being served. 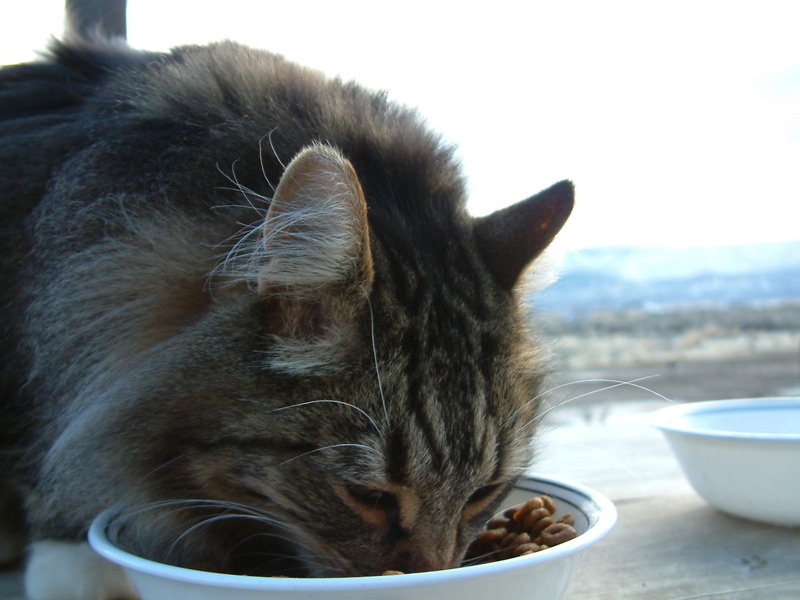 Dry cat food contains a lot of bacteria. When you add water, you give them an environment to thrive and grow. You may want to discontinue this method. I have been feeding my girl Pure Vita but am now very thrilled with it. She has thrown this up a few times but before when we kept her on Blue Buffalo, she was constantly throwing up. I am hoping to put her on a much better dry food and was wondering what your thoughts were on Nulo. It must be a new brand as I’ve never heard of it until recently. I unfortunately do not have stores that carry Orijen or the other top brands so I am somewhat limited. Amenia ~ I’ve been feeding my kittens Nulo for two weeks. It looks great but it is causing diarrhea. I feel it may be due to the agar agar since it known to cause a laxative effect. Or it may simply be to rich for them. I’m also giving my dog Nulo and her stools are fine but she has horrible gas. I switched the kittens to Tiki now for two days and no gi issues. I wanted to switch my dog also but the Tiki for dog has garlic in it. I originally used Orijen for my two girl kittens. They did very well on it. However, I thought I’d try Young Again 50/22. I tried for over a month to switch them without success. YA seems to be way to rich for kittens, at least for mine. I was not able to give them enough in the way of calories without causing diarrhea and awful smelly poo, thus they were loosing weight. One really was becoming quite skinny. After switching back to Orijen, they have had much greater energy and seem to feel much better. As they are now about 1 year old I may attempt AT SOME TIME to switch them over, because it has a much lower percentage of carbs. However, Orijen works very well with no issues and is an excellent food, so I’m definitely going to wait and go slow, it at all. Looking at other comments re: YA, most comments seem to be owners who are using their carb-free formula for diabetic cats. I’ve not read any comments re: the 50/22 formula, so I’m wondering if the diabetic formula is where their market is. Thought i was doing well feeding ( 2- 1 year olds )them Fromme- costs more than i eat in a week- but no? I’ll be shopping around then,they deserve the best& are pretty sedentary housecats . Any wet-dry recommendation combinations?? I have 3 young boys, and considering one has already had urinary issues, I have switched them to mostly canned. It is amazing how much more urine is in the litter box now. They are BIG eaters, and need several “meals” a day to keep them out of my hair. I do canned food for breakfast and dinner, and give a small amount of dry food at midday and bedtime to hold them over. For canned I have been feeding Innova EVO 95% chicken, b/c it comes in large cans, but will be switching due to the carrageenan in it. I plan on trying Tiki Cat Puka Puka. For dry I do Nature’s Variety Instinct Chicken. Check Amazon (esp. 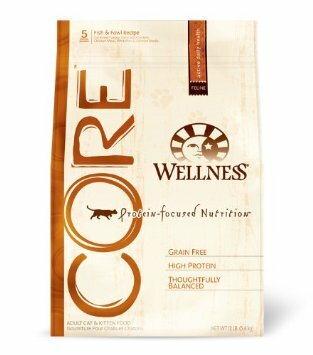 if you have Prime) and also Petfood Direct, which you can usually get coupons and/or free shipping. About to try Fromm Family cat food. They are based out of Wisconsin and are a family business. Interesting history and some good looking products. We’ll see how it goes. Has anyone had any experience with them? Fromm is an excellent food! Part of my regular rotation and I don’t believe they’ve ever had a recall which is hugely important to me. Comparable quality to Orijen. I like Fromm as well. However, their formulations contain some form of fish or chicken which I am trying to avoid. I believe their dry food might be slightly higher in the carb count, but you should double check. Really great company. I wish they would add some novel proteins to their line. Overall, good choice! 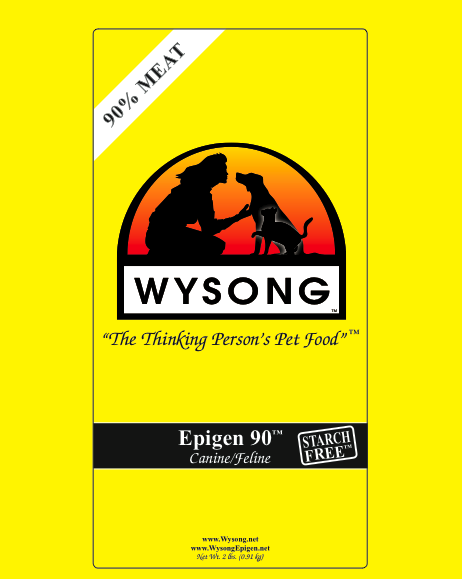 Can you please review the new formula of Wysong Epigen 90? My cat was very happy on Epigen 90 along with her wet food. But they recently changed the formula. Although the carb % remains the same, some of the ingredients look questionable and pple have been saying their cats are getting sick from it. My cat has a very sensitive stomach and is allergic to fish. Epigen 90 was the perfect choice. But with all complaints, I have been debating whether to have her try the new formula. She is currently on wet food only but is losing weight bc she prefers the dry. I would appreciate any advice you can provide. Thank you! Thank you for this list. I am a believer in canned cat food, for all the reasons you mention, but my cat is not. I don’t know if it’s because he has asthma (though it’s under control), but he does not have a good appetite, and he will gradually waste away if only fed canned food. So I’m glad there are some low carb dry foods available. I’m going to work on getting more liquid into him, since I know cats on dry food won’t drink enough water to stay fully hydrated. Perhaps he’ll drink chicken broth. I’m new to this blog, so perhaps I’m too late to reply to you, Kathleen, but I’ll go ahead & do so anyway. I have had many cats over the years (strictly indoor) & have found they drink more water from the fountain style watering systems. I’ve tried a couple of different kinds in the past. The first was constructed of plastic which I ultimately got rid of. I didn’t like the way mineral deposits from my water accumulated on the plastic. A couple years ago I splurged & bought the stainless steel version which both I & my cats have been very happy with. No mineral deposit accumulations. While the bowl part of the system is rather large, my cats always drink from the fountain portion. I also have a reverse osmosis system hooked up to my kitchen sink & use only that water to fill the bowl. I feed my cats a combination of canned & dry food. One cat has allergies & putting her medication in the wet food works wells for us. Hi Valerie, I feed my cat Natures Variety canned & dry but also looking for another brand to rotate with. Do you have any suggestions? Have you looked into Wild Calling? They seem comparable to NVI in many respects. I rotate it with Natures Variety myself.. Just in case. What do you think about the starch in Blue Basics Limited Ingredient Grain-Free Formula dry?